Uninterruptible power supply UPS is a device that is using emplacements of electrical components and belonging of the ups parts when the main power is lost. UPS always arranges the voltage and frequency of the main power and then gives the systems clean energy. It also charges power inside battery systems to use for emergency situations. You can also chose needed back up minutes for your machines with battery system. UPS uninterruptible power supply usage protects your systems machines against any information lost and damages. As Mak Plus Power Systems Germany we supply uninterruptible power supply, three phase 120 kVA UPS USV 0,9 Power factor, 108 kW UPS. The solutions are designed in Germany with IGBT and transformerless using advanced high technology. We designed our 120 kVA uninterruptible power supply UPS three phase systems in Germany with European standards with high quality technology. Our expert engineers and technical team work for designing and testing for long days to give you the best solution. Our three phase 120 kva industrial UPS machines are compatible for too many applications. The small immediate effect after reports of fire risk design of 120 kva uninterruptible power supply three phase solution makes maintenance and installation easier for your technical team. Mak Plus Power Systems Germany 120 kva and other UPS solutions provides you high efficiency but very low total cost. Digital functions controll the three phase 120 kVA UPS makes your control easier. Because with SNMP system you can control your uninterruptible power supply machines from your computer or smart phones. After you buy any 120 kVA or other UPS solutions, we can service as Mak Plus Power Systems Germany whenever you need. MAK-UPS Series ( Germany ) 120 kVA UPS are true online double conversion topology with high frequency power solution, manufactured with the state of the art, PWM and IGBT technology, producing microprocessor controlled pure sin wave output. The three phase 120 kVA UPS Germany needs 60, 62 or 64 pieces of 12V AGM & GEL Batteries. 2 years of warranty. Our 120 kVA UPS industrial solutions are easy to use. There is a protection against overload and short circuit. Green power technology is also really important for our 120 kVA three phase UPS systems. Automatically charging battery at UPS off mode is an advantage when you need to use UPS for your systems if main power is lost. Please note that each of our UPS USV solution can work three phase in one phase out. As producer our team offers international trainings also in your field. We offer free of charge technical videos. They offer visual documents to inform you to your needs. ​UPS-MAK Series Germany 120 kVA UPS three phase protects and supports systems such as advanced local networks, communication systems, medical devices, measurement devices for engineering purposes. The 120 kVA three phase UPS solutions that we give are highly efficient solutions designed in Germany. 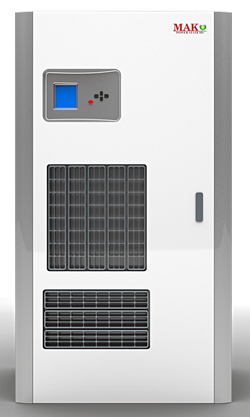 The 120 kVA / 108 kW UPS solutions are designed in Germany and produced in Europe.